Crafter’s Corner coming in 3 days! After weeks of patiently (and sometimes not-so-patiently) waiting, Otion’s Crafter’s Corner Grand Opening party is happening this week! 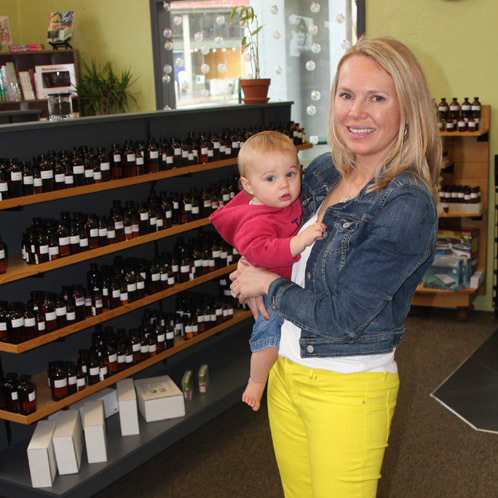 Otion is Bramble Berry’s retail outlet located on 301 W Holly St. in Bellingham, Wash, and their Crafter’s Corner grand opening event will begin at 10 a.m. on Thursday, May 8. The first 30 people to stop by will receive goodie bags filled with Otion and Bramble Berry swag. Crafter’s Corner is around the corner! 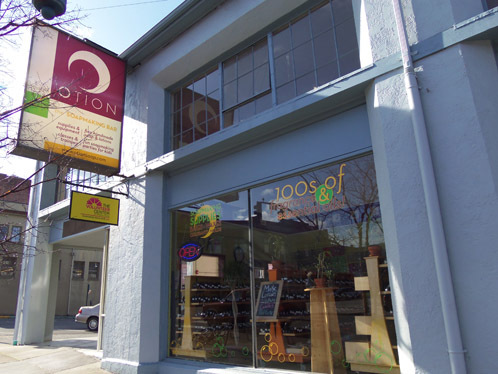 If you’re ever passing through Bellingham, Wash., stop by and pay Otion a visit. 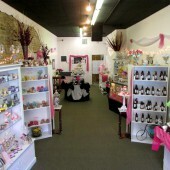 Otion is Bramble Berry’s retail outlet, and it carries fragrances, molds, bases and more. 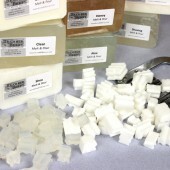 Otion is also a great place to take a soapmaking class, practice soapy techniques and chat with expert soapmakers. 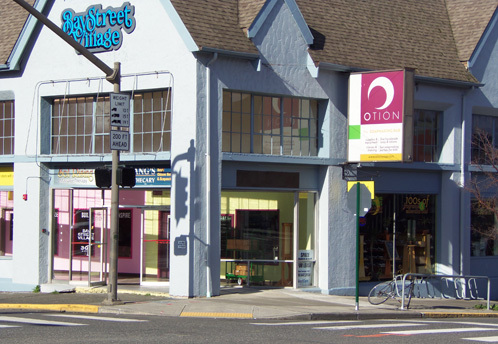 The Otion storefront on a beautiful Bellingham day. 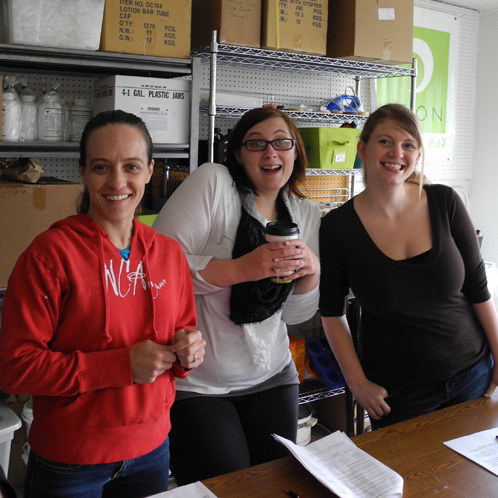 This is a guest post from Otion, our a retail store in downtown Bellingham, Wash. 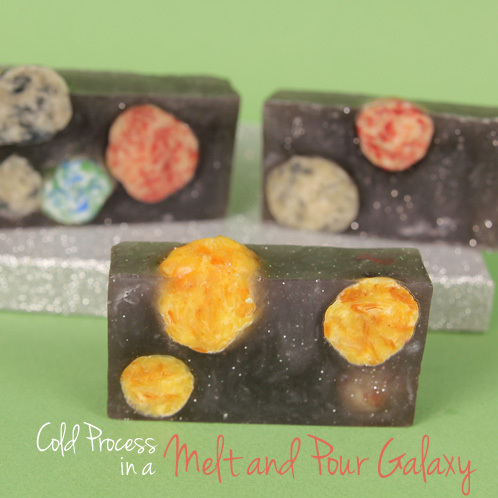 This tutorial is similar to our Intergalactic Planetary Melt and Pour, but with a twist; the planets are leftover shreds of cold process soap, making this project a great way to give new life to old soaps. 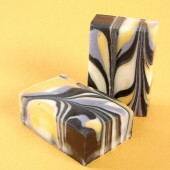 This is a very simple swirl technique comes to us from our friends and Otion, and it yields dramatic end results. 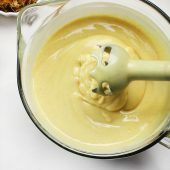 This is a great beginner cold process recipe, but it is important to keep the batter nice and thin during the entire process. That’s the key to getting nice rings of color and making the end swirl really pop. 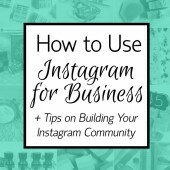 We learned this neat technique from one of our fabulous customers, Marlona of The Little Things Store! 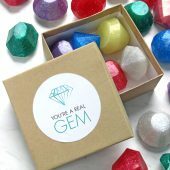 These geodes will be so realistic, you’ll fool all your friends. 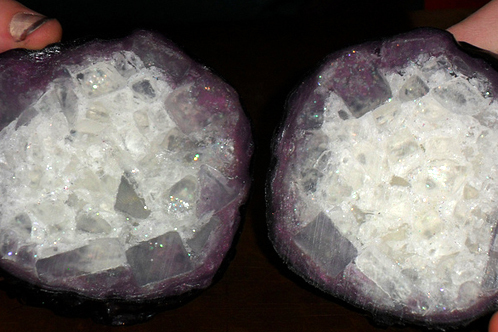 People won’t believe they’re not real geodes! 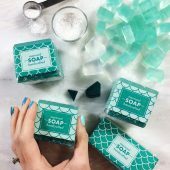 ONE: You’ll need 4oz of clear soap cut into small “shards” and another 4oz cut into large “shards.” You want odd-shaped triangles. 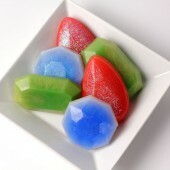 Melt down 2oz of clear soap and cool until it’s comfortable to touch for the next step. 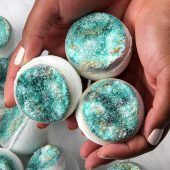 TWO: Take all those small shards, and sprinkle two pinches of iridescent glitter on them and start smooshing them into a rough ball shape. 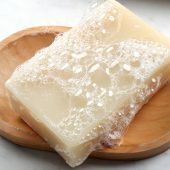 Drizzle some of the cool soap over your shmooshed soap shards to help keep them together if they’re falling apart. 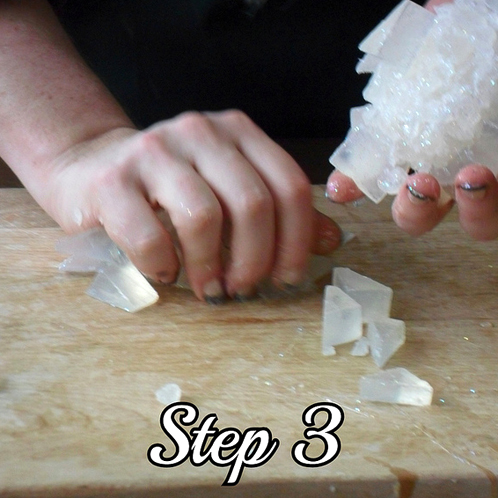 THREE: Now, start shmooshing those larger shards onto your smaller ball. 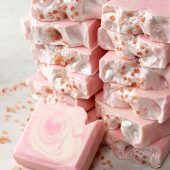 You may have to melt some more soap to drizzle on top to keep everything together, so take your time and don’t stop shmooshing! 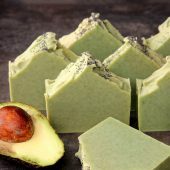 When you’ve gotten all the shards packed on there, give it a good all-over drizzle with clear soap and let it cool on your wire dish or cookie cooling rack. 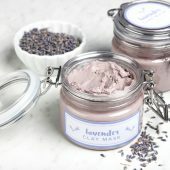 FOUR: Melt down 8 oz. 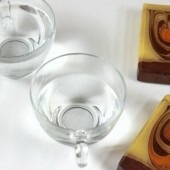 of clear soap in a large Pyrex or glass bowl. 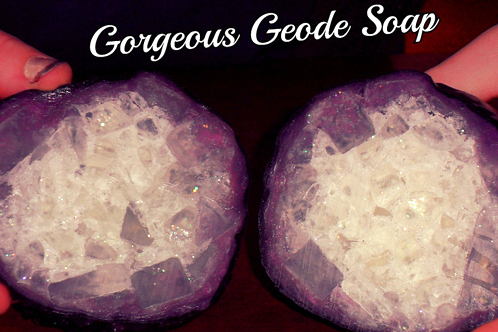 It needs to be big enough to dip your geode and get your hands in there. 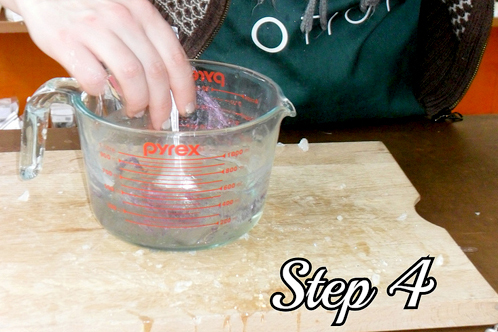 Add 1/2 tablespoon of amethyst purple mica. 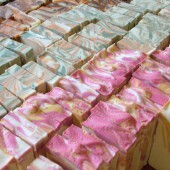 We’re over-coloring the soap so that we can get away with fewer layers for a saturated color. 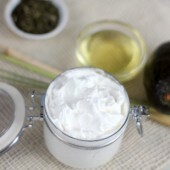 FIVE: Now add 20 drops of lime essential oil and start dipping! 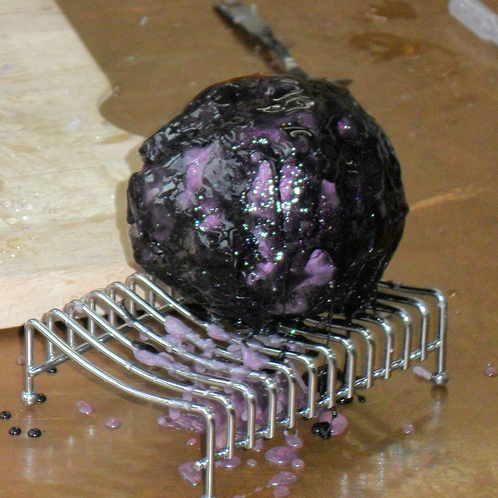 After you coat the entire surface, set the geode on a rack to cool before doing another dip. 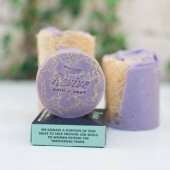 We did 3 dips to get a good, purple color as shown below. 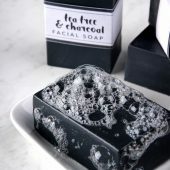 SIX: To the remaining melted amethyst soap, add a full tablespoon of activated charcoal. 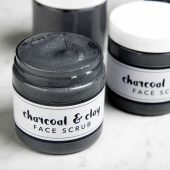 We’ll dip the geode into this just once to get a shimmery black coat that’s a little bit sheer. Let the geode harden and cool before cutting into it. This won’t really take long, so go make a cup of tea and come back. 2. You’ve warmed your knife under hot, hot tap water. 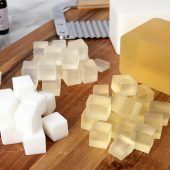 This will ensure that the knife slices through the soap like, well, a hot knife through soap and you get a clean, drag-free slice. Otherwise, some of the packed shards in the middle may be knocked loose. And you’re done! 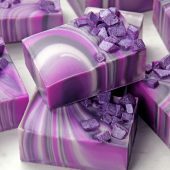 Enjoy and display your lovely geode soap. 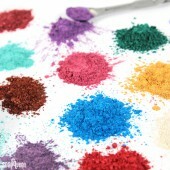 Experiment with different colors and glitters! 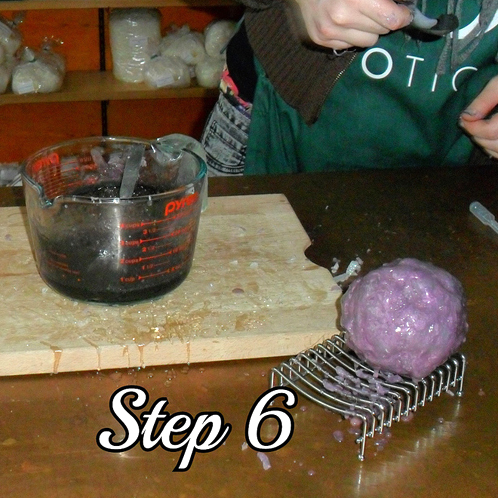 And, as always, share your results with our soapmaking community on our Facebook Page. 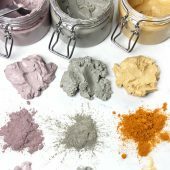 Have you used Bramble Berry’s new Brazilian Clays yet? 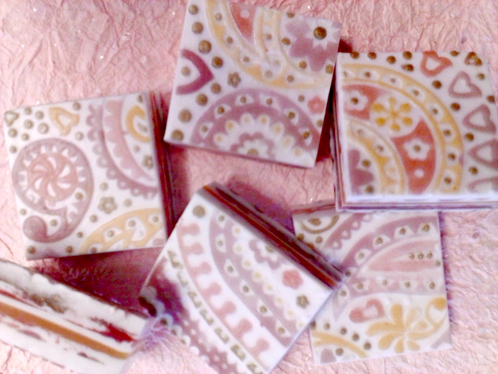 Otion did and they came up with this fabulous Paisley Melt and Pour Soap that was done exceedingly well. Read on to be inspired and learn how they made it.~A-M PS – This injector tool is the secret weapon of many talented melt and pour artists. 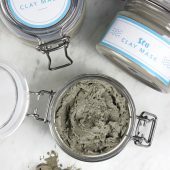 We’re head over heels for these lovely clays, and they’re a perfect for those romantic and sultry colors. 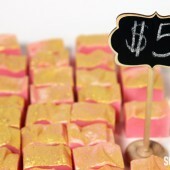 We used the Paisley Tray Mold and a Syringe Injector to do the detail work with the purple, yellow, dark red Brazilian clays and heavy metal gold for some sparkly touches. 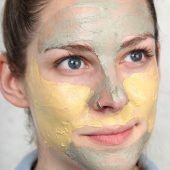 ONE: Cut up and divide your aloe base into 4 mugs. 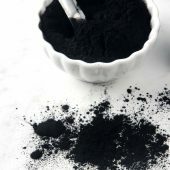 We’ll work with the colors one at a time, so melt one mug and add 1/4 tsp of your first color clay and 3 ml of Lovespell fragrance. 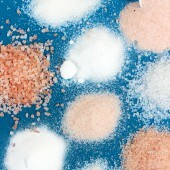 Mix well! Use the injector tool to fill in the areas you like, remembering that you’ve got 3 other colors to work with, so don’t fill in everything! You can always go back and change your mind later, so don’t worry too much. 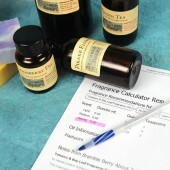 Tip: To see your details better, put your mold on top of a white piece of paper! Repeat with the rest of your colors until all the detail cavities are filled. 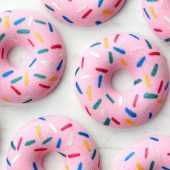 Wait for them to cool, and spray liberally with alcohol. 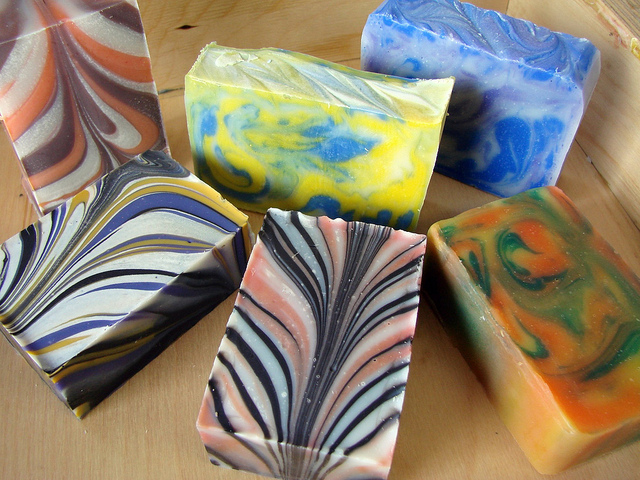 You should have quite a bit of colored soap left over; don’t worry, we’ll use it up! 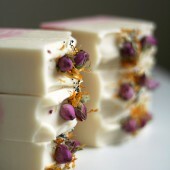 TWO: Melt 4 oz of shea soap base carefully. We don’t want it too hot, or it’ll melt all that detail work! 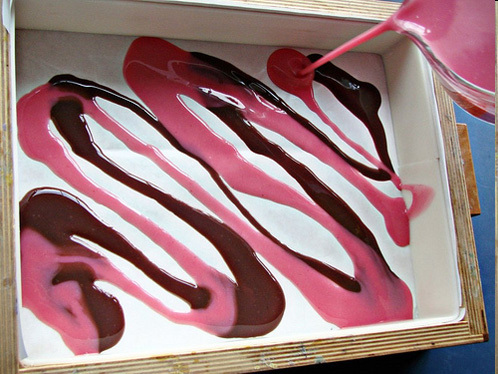 It should not be steaming, but rather should be cool enough to have formed a thin skin (just like pudding!) on the top of the container. 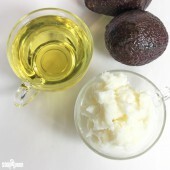 Stir in the skin to melt it, and spray you detail work with alcohol. 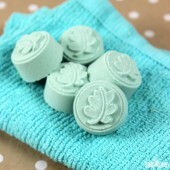 Pour the shea soap over your details. 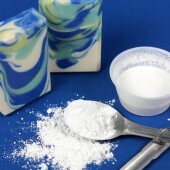 Allow to harden fully, and spray with rubbing alcohol before the next step. 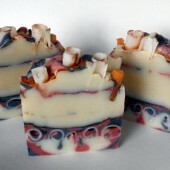 THREE: Melt back down all your other colors and remnants, and the rest of your shea soap base (12 oz). 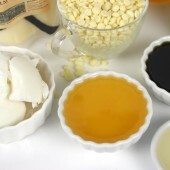 Add an additional 1/2 oz of fragrance to the melted shea soap. 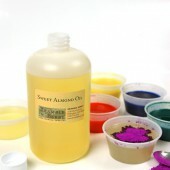 Alternate pouring white with your colors before each layer has hardened fully for a swirled effect, or allow each layer to harden before pouring the next to get crisp layers. 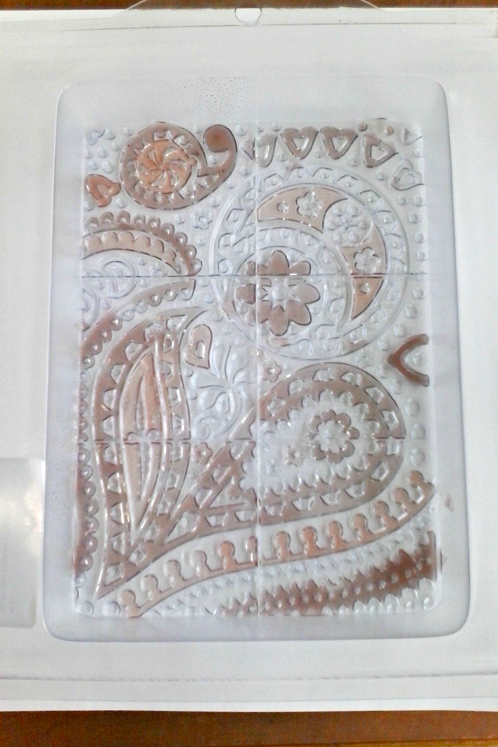 (I found I didn’t have enough soap left over to do complete layers). If you only have a tiny amount of a color left over, like I did with my purple and gold, drizzle over a white background randomly for a lovely marbled effect. 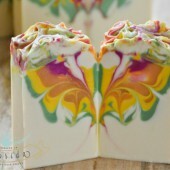 Whatever you do, you’ll have color all through your soap so it never gets boring once the design has washed off! 1. Have a cup of very hot water around to clean out your syringe. 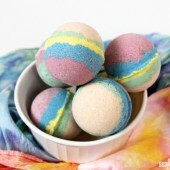 Clean it often with the hot water to prevent soap from clogging it up! 2. Patience, patience, patience! Don’t worry about coloring outside the lines, because you can always clean it up later with a tooth-pick or scraper tool. But don’t rush things! 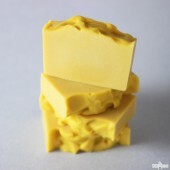 If your soap is too hot when you try to use it with the syringe, it will squirt out in big, hard to control puddles. 3. Have fun! 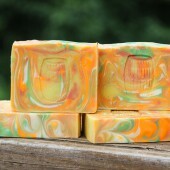 This is your work of art, and it’s a great way to spend a rainy afternoon and practice your soap art skills. 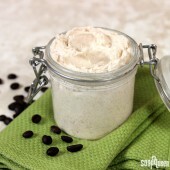 I have always wanted to make whipped soap, also known as Floap. 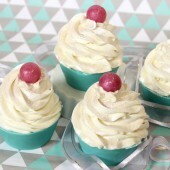 It floats in the bathtub, looks like whipped cream, can be piped like frosting, and it’s not something we’ve ever done before! 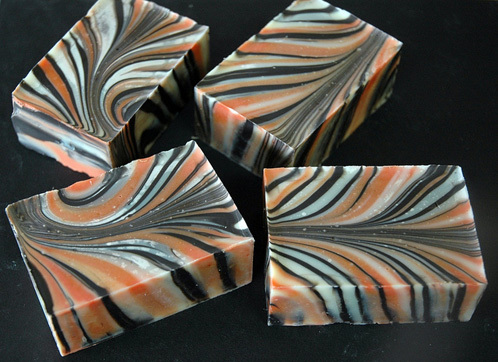 I must say, there are quite a few things I’ll do differently next time, but I’m still thrilled with how this soap turned out. Bramble Berry’s customer service team (what a great bunch of gals they are) had another fun team bonding experience at Otion last week! 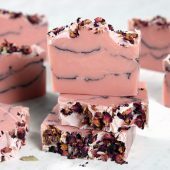 They made cold process as a team too so be sure to check out that post if you missed it (Cold Process and Customer Service). 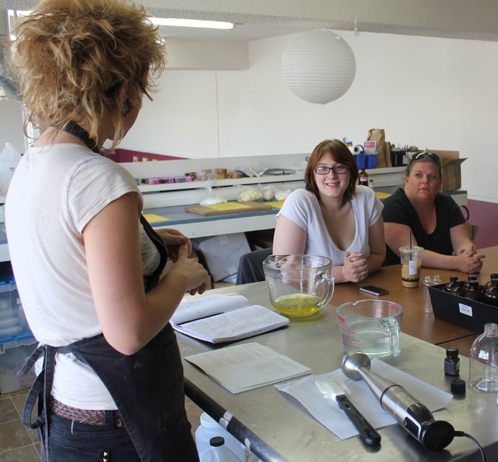 Team BB delved into the wonderful world of lotion making from scratch using Cocoa Butter, Shea Butter and luxurious fixed oils. The class was taught by Otion’s newest addition, Alycia! She’s already a pro at teaching classes so if you’re local and interested, check out Otion’s class schedule HERE! 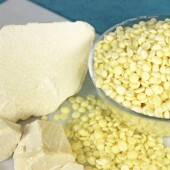 Cold Process and Customer Service! 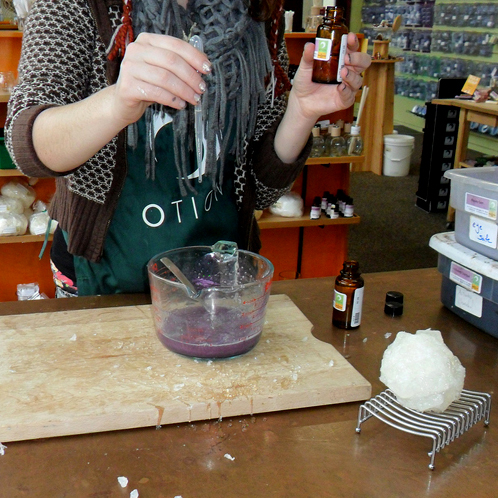 Last week Bramble Berry’s fabulous customer service team was able to take a soaping class with the soaperrific Kat at Otion (Bramble Berry’s retail store). 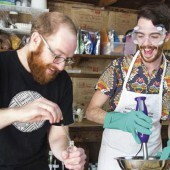 They made a fun and simple cold process recipe while having a great time as a team. Check it out! This is the grand finale of my advanced swirling tutorials. Today is linear swirling! 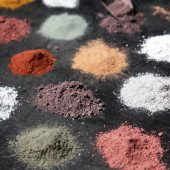 Make sure that you check out parts 1 (Understanding Color Theory Terminology) , 2 (Getting Brave with Color), 3 (Soap Design and Color Matching) and part 4(In-the-Pot swirling) if you haven’t already. Learn the secret to a fabulous linear swirl! 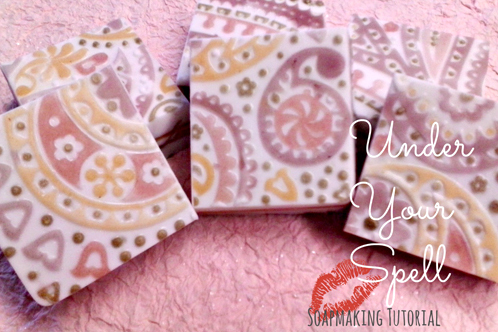 Before you get started, check out my must have materials for swirling! 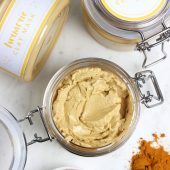 Step 1: At a light trace, separate half of the batch into two smaller containers; one for each color, add scent by hand before pouring. Step 2: Linear swirling is about building layers. Create a pattern using the two colors first so there is something on the bottom of the bars. 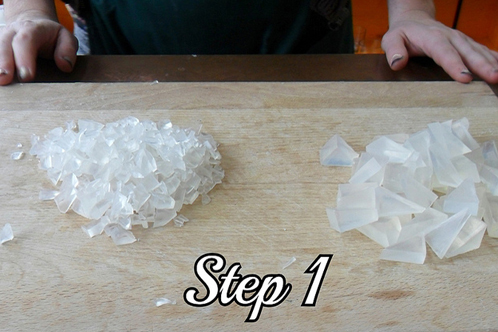 Step 3: Pour about ½ to ¾ of the white on top for the mid section which your lines will form into. Welcome back! 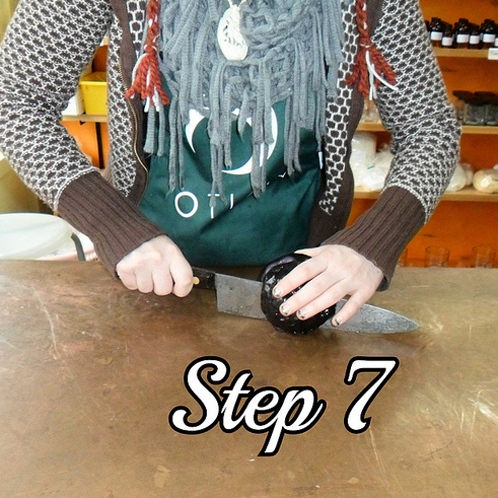 This is part four of Kat’s advanced swirling tutorials. 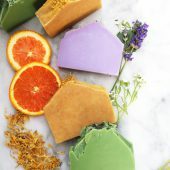 Please make sure to check out parts 1 (Understanding Color Theory Terminology) , 2 (Getting Brave with Color) and 3 (Soap Design and Color Matching) if you haven’t already. 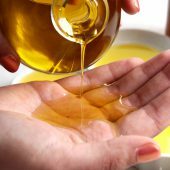 In this section, the secrets to successful swirling are revealed! 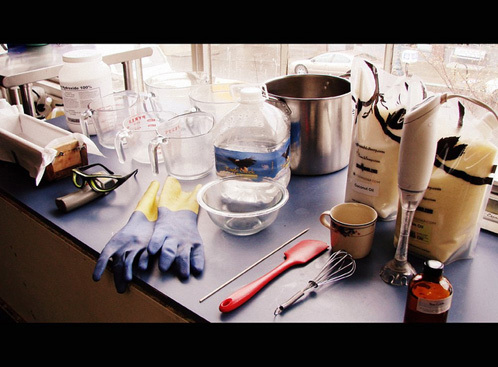 Before beginning, make sure to have all safety equipment and supplies at hand. 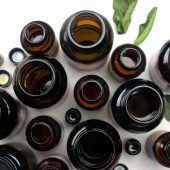 Have your colors picked and prepared and your fragrance oil weighed, line your wooden mold and have divider inserts set up on the side. Snug fitting rubber gloves are ideal for maximum dexterity (Tip! Pick up some hair-dying gloves from the local beauty supply store). 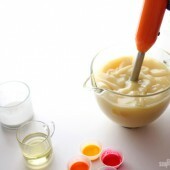 A rubber spatula is your best friend for swirling! This tool manipulates the swirl pattern and pulls it through the entire bar. 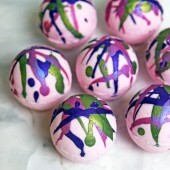 Use a bamboo skewer for creating finer details and surface swirls. 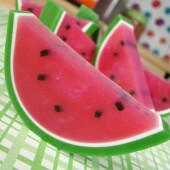 You will also need extra smaller heat resistant pitchers for dividing the soap into sections to color. 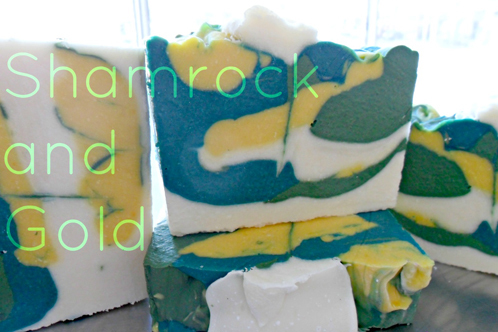 Now that you understand the fundamentals of cold process Soapmaking, let’s get artistic! 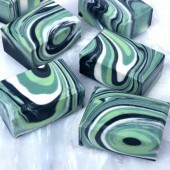 You can set your product apart from the rest with eye-catching swirls and have fun in the process. Not familiar with cold process yet? 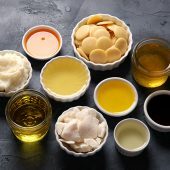 Check out these videos on Soap Queen TV to and learn about Lye Safety, The Basics, Fragrances and Colorants. It’s time to take those bars from boring to beautiful!